In every battle a player plays there will most likely be tanks. 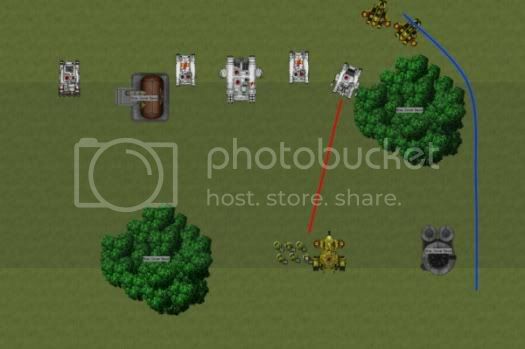 Tanks play a vital role in every army (other than Necrons) and as such antitank plays a vital role on the battle field for without it you will surely struggle. From this there is an overall chance of destroying at around 14%. Where as a lascannon only manages 7%. That is why it is such a great tank killer. Don't be put off by the percentage it is always low when you work it out. Actually comparatively speaking a railgun is one of the best. Often overlooked the ioncannon is extremely effective on enemy transports (usually front AV 11). The percentage given is per shot not overall. One ion cannon hit has around a 7% chance of killing. Overall three hits there is around a 22% chance of killing (multiple immobilizing results. From this the ion cannon is obviously a powerful transport killer or if it gets a rear armour shot a medium tank killer. A note on tank secondary weapon systems. I can not stress this enough DO NOT GLUE THEM IN PLACE, as the rules state a weapons LOS is taken from how far it can physically turn in the real world but glueing it reduces this to a strict set of rules. The weapon pods on a hammerhead are classed as hull mounted so glueing them will reduce that huge arc of fire to 45 degrees straight ahead. The broadsides have only two layouts of weapons which are a Twin-linked Railguns and either a SMS or plasma rifles. 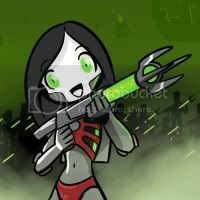 The Railgun is the best antitank weapon in the tau arsenal as a strength of 10 means that it can always penetrate a tank (Unless targets special rules state otherwise). The effectiveness of killing a AV13 tank increases to 21% with the twin-linked railguns. Advanced Stabilisation System (A.S.S. ): Allows battle suits to move and fire using the Slow and Purposeful special rule granting the user some mobility though it may not be much. This is useful if you prefer to move and fire. Drone controller: Only two types of drone are really useful here. The marker drone can give markerlights out to targets before the broadsides giving +1 BS Definition: Battle Sister or Ballistic Skillor shield drones for extra wounds with a 4+*. Multi Tracker: This means that they can fire both weapon systems though they have to be targeted at the same unit. Shield Generator: Giving them a 4+* save. Target Lock: Only use in units of more than one. Allows the Broadside to target a different tank than the rest of the unit. Targetting Array: +1 Ballistic skill can be useful but it can be overkill on top of the twinlinked. Popular setups include a Broadside with SMS and either shield drones, Target lock, A.S.S., targetting array or a multi tracker. These basically sit near the rear usually in cover taking out tanks starting with the heaviest then working their way down to transports. There is not much to say on broadside tactics as they have a very specific role on the battle field. Once done with tanks they can move on to high powered units such as elites or HQs. Ion cannon or a railgun as the primary system. Then either Burst cannons, a SMS or a pair of gun drones as a secondary system. The ion cannon is effective at taking down lighter vehicles and transports such as rhinos as opposed to heavy tanks. For information on the railgun see above. The hammerhead may select any tau vehicle wargear. The burst cannons can be used if you are low on points, as they are dual they also fire 6 shots instead of 3 twin-linked shots. The SMS is good at stopping enemies using cover to block LOS, they also ignore night fighting rules. The rail gun is the most common main weapon due to its high strength. Though the ion cannon is effective against high toughness infantry, light tanks and heavy tanks rear armour. The hammer head is best complimented with disruption pods, a multi-tracker and a target lock (see wargear listings for reasons). The target lock will allow it to shoot attackers without having to forgo a turn of you main weapon tank killing. The hammer head is able to destroy tanks effectively while still being able to move, if taking disruption pods there is nothing to gain from moving to cover as both have the same effect. Although if facing an fast army it probably is best to go to cover in case. Like broadsides you should target the biggest vehicle threat each turn. An ioncannon should be used against tough infantry of light transports or tank rear/side armour, the ion cannon is often overlooked in favour of the railgun but it is also agreat anti tank given the right targets. You shouldn't move your tank great distances to get your secondary weapon system into range, it should remain a weapon for defense if enemies get too close as a primary weapons range and the secondary weapons range do not mix well. If your enemy gets a weapon destroyed most likely it will be your main weapon gone so in this case you can either hide the vehicle to prevent them from gaining KPs or drive around tankshocking and shooting with your secondary system (If SMS is taken you may be able to sit behind cover and fire at the enemy). If you were to add sensor spines you would be able to sit on top of cover increasing your LOS while claiming the benefits of being in it. The submunition is a highly potent anti infantry weapon and should not be underestimated. Also fitting it with seeker missiles means that any one with a markerlight can call in a strength8 shot without affecting the hammerhead. Ioncannons can destroy heavy infantry (MEQ) effectively aswell as tanks. The skyray is armed with six seeker missiles, two networked markerlights and a secondary wepon system with the same options as a hammerhead. Note; Seeker missiles are one shot use! The skyray may select any vehicle wargear options (except more seeker missiles). The burst cannons are for those with not many points although the fact that the SMS requires no LOS makes it very attractive (see tactics). In this case gundrones are also a viable option (see tactics). The sky ray is best used against tanks. The obvious tactic is to use its markerlights to light up the enemy and launch seekers while shooting with its secondary system as well but this puts it at great risk. The other option is to equip it with SMS and head for cover giviing no enemy LOS then it relies on using other markerlights to launch seekers from safety while the SMS can still shoot at the enemy. 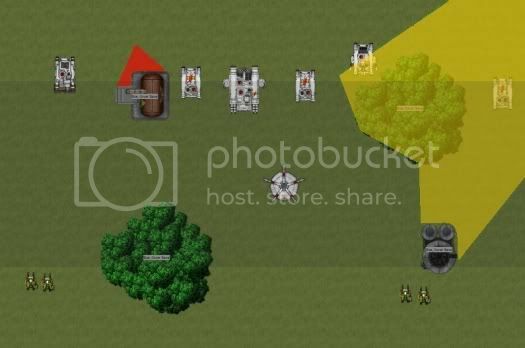 The third option is to equip it with gun drones then at the start of the game detatch them to attack enemy while creating a minimun range of 36" (markerlights). Once all of the missiles are gone you may either hide it to prevent KPs or send it tank shocking and general harassment of the enemy, this will draw fire away from the rest of your army on to it. Also of note is that when fitted with a targetting array it's markerlights become the most accurate in the tau arsenal, once your missiles and secondary weapons are gone many enemies overlook the sky ray, until BS4 fire warriors start mowing them down (potentially BS5). As mentioned above harassment. It can also take out TEQs. There are other anti tank including suits as missile pods are effective against transports and fusion blasters against tougher vehicles. for more info consult this: http://forums.tauonline.org/index.php?topic=82330.0. There are also Pirahnas but that is out side my area of expertise. All I know is to equip them with a fusion blaster and seekers before turbo boosting behind an enemy tank and launching a seeker. Sensor spines: Enables the tank to claim the obscured target benefit of a terrain feature without the danger of dangerous terrain tests. Targetting array: Enables the tank to fire at +1 ballistic skill. Multi tracker: Enables the tank to fire as if it was fast. Blacksun filter: Enables the tank to double their roll for night fighting. 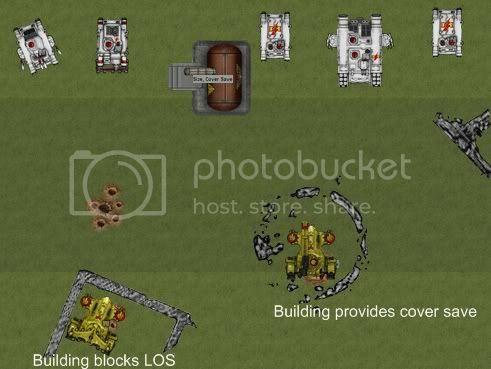 Target lock: Enables each of the tanks weapon systems to target different units, useful for still using your primary weapon on it's intended target while the secondary system deals with attackers. Flechette discharger: Enables the tank a degree of defence against close combat. Any model attacking it will be wounded on a D6" roll of 4+. Disruption Pod: Enables the tank to gain a 4+ cover save against any thing firing from over 12" away. Decoy Launchers: Any immobilized result on the glancing table may be rerolled though the second result must be accepted. Seeker missile: A powerful missile with no range that can be called by a markerlight. It doesn't affect the tank in any way though may be destroyed via a weapon destroyed result. However they are single use and there is a maximum of two per vehicle. X+*: indicates an invulnerable save of X (Whatever the number is). A few tactics that any tank can pull off and has been mentioned earlier. No its not a way to get sued it is a legitamate tank tactic. As you can see (if the pics are not too fuzzy) the skyray in the top picture has lost its weapon pods and its missiles and apart from marker lights it is useless except for this. This tactic can be used by any tank that has lost any usefullness but shouldn't be attempted by those concerned by KPs. The skyray has made its way to enemy lines and then it has charged straight forwards tank shocking the infantry but thanks to fifth edition rules it can carry on going and in this instance hits a predator(though you could end up just tank shocking again). This ramming will carry a strength of 8 as and the sky ray recieves a strength 6 attack back. Our skray ends up wrecking it making it and our skyray managed to survive. This draws a lot of fire in revenge giving you time to sort out the rest of your forces. I will start with what the hammer head is doing. The hammerhead is equipped with sensor spines and has positioned itself so that it is on top of a piece of terrain giving it an increased line of sight but the sensor pods allow it to claim all the benefits of being in the ruins, the sensor pods are extremely useful. The skyray has positioned itself so it completely blocks LOS as it doesn't need it and it is also equipped with SMS which enables it to fire out all this gives it a huge amount of protection from the enemy. Tactics for units working together! Throughout this section a random white scars army I thought up will be our victim and the only tau on the board will be those involved in the tactic. Here is a situation Where our white scars have gone tank heavy and tried to hide a few in cover, but not when these railguns are around. This is best for more static armies and means no tank is safe, it can be used for broadsides or hammerheads. 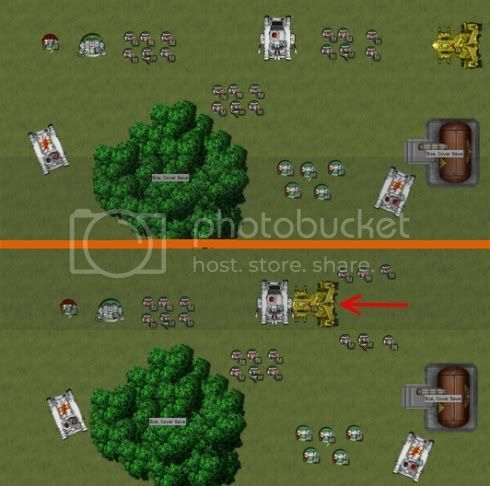 The two teams are positioned so that any tank can always be shot by one team or another. The yellow areas are where will actually receive a cover save from both teams and the red is where the two teams are both unable to see which really is not large enough to fit a tank in. Here we again have our tank heavy friends the white scars. The idea here is to fit the pirahnas with seeker missiles and move as fast as possible to place them behind the enemies rear armour (the predator). The pathfinder team (or anything else with markerlights) then lights up the predator calling in seeker missiles to blast it from the rear. A simple but deadly tactic to take out tanks, however it is ineffective against tanks with equal armour all round. That concludes this review of the Heavy support choices available to Tau under the 5th edition rules.